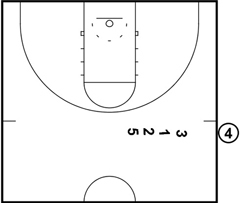 The following stack sideline out of bounds play is a simple, yet effective play that can allow your team to easily inbound the ball and immediately create a scoring opportunity. The play begins with 4 taking the ball out of bounds. 3, 1, 2 and 5 start across from the ball, lined up in a stack formation. 4 is looking to get the ball into 1 who is cutting hard to the right. 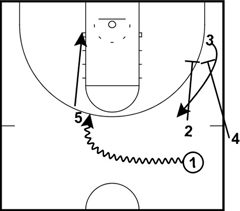 3 breaks away from the ball, ending on the right wing, just outside of the three point line. 2 cuts up the stack right to the ball. Unless 4 can not get the ball to 1, 2 is mainly a decoy. 5 floats away from the ball, looking to create space. 5 can be a safety valve if 4 is having a hard time getting the ball in bounds. Once 1 receives the pass, he dribbles the ball to the opposite side of the floor. As 1 is dribbling toward him, 5 makes a hard cut to the left low block. He immediately posts up, looking for a pass. After 4 passes the ball to 1, he and 2 set a down screen for 3 who cuts from the right wing to the middle of the lane. The left side of the floor should be very open, so the first option for 1 is to dump the ball down to 5 in the low block. If 5 receives the ball, he should immediately go to work and look to score. If 1 does not have a pass to 5, his next option is to look for 3 who has used a double screen to get open on the right side. 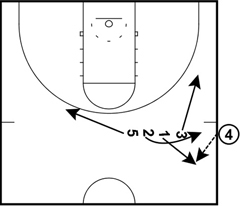 If neither option is available, 1 should pull the ball back out and set up a regular offensive set. 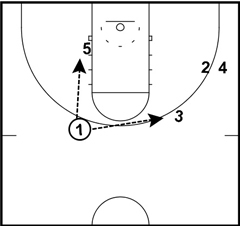 Using this sideline out of bounds stack play not only gets the ball in bounds against pressure defense, but it also creates space for an easy post up or curl off of a double screen. I like this. It looks like you can use this against 1V1 and tight man-ups. The guys I teach are low ability students, but given time and practice, I reckon we could use this to really good effect. We do this for years against full court press. with a slight variation. 1 is taking the ball out off bounce and the ball has to go back to 1 ASAP to beat the press. The rest of the line-up is 4, 2, 3, 5. Player 3 decides which side (left or right) he and 2 go, by tapping 1 (who's in front of him) on the shoulder. 2 goes to side of the tapped shoulder and 3 goes to the opposite side. The side/shoulder 3 chooses depends on where the opponent is standing. I like this because it has several release valves. 5 getting it in the post could also look for 4 cutting to the key area for a layup on the weak side or 2 spotting up for a 3.
can a defense simply surround the offensive players when they are in stack formation?